The problem with so many forges is the limitation of the fixed doors and the height of the fire box. 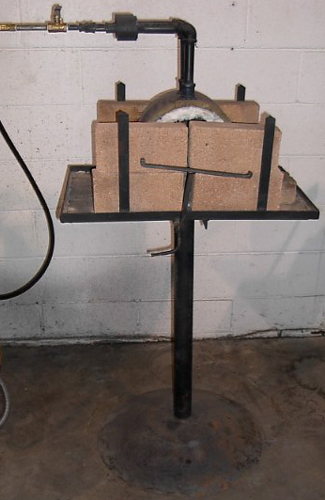 Gordon Williams (Pieh Blacksmith School Instructor) designed this forge and uses them in all our classes. You have flexibility with the bricks used as doors....you can open or close them as much as you need to. The forge is shown without bricks (except the bottom brick which we always include). Bricks make the cost of shipping much higher. You can order with the 8 bricks for the doors should you choose-or you can purchase fire bricks at most Home Depot stores. 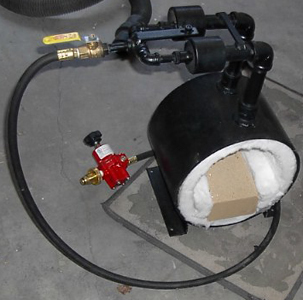 The forge comes with a Fisher Regulator (3-35 psi) and POL fitting, all the necessary orifices, hoses and gate valve. It is ready to use! The forge is lined with 1 inch thick 8 lb Kao Wool blanket. The forge does not come with a stand so you can put it on whatever you choose. We have shown a photo above with it on a stand to give you some ideas. 11" O.D. and 10" I.D.